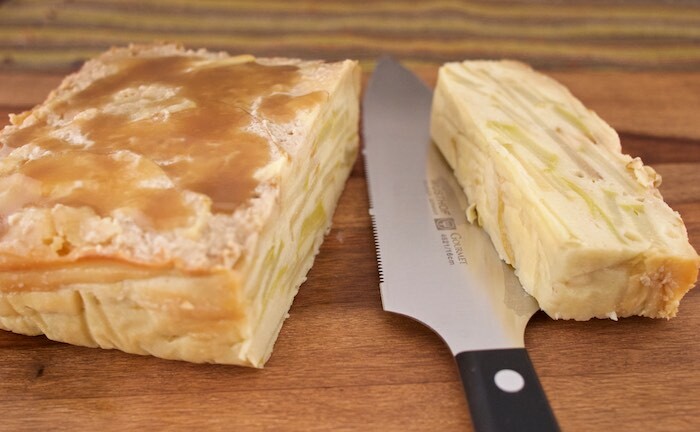 Food Hunter's Guide to Cuisine: Pear & Salted Carmel Cake & A Baker's Dream Giveaway! Pear & Salted Carmel Cake & A Baker's Dream Giveaway! Have you ever opened a cookbook and instantly fell in love with the exquisite photos and delicious recipes? This is exactly what happened to me with Hillary Davis' cookbook, French Desserts. I've never been to France but simply browsing through this cookbook made me realize how much I would love the desserts in France. Recipes like the Pear & Salted Carmel Cake (below), Lime Yogurt Cake, Butter Cake, and more fill the pages of this delightful cookbook. But having a good cookbook is pointless without quality bakeware. 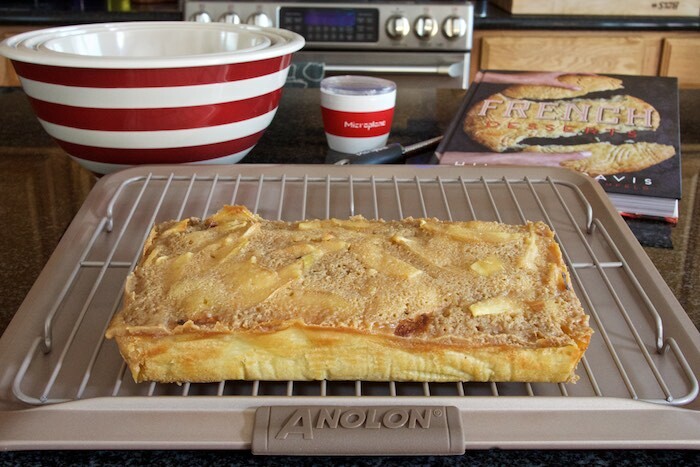 I recently got to try the Anolon Advanced Bronze Bake-ware Set and loved it. The 5 piece set includes just about everything a home baker needs to create the delicious treats found in the French Desserts cookbook. What makes this set special are the wide rims fitted with silicone handle grips for easy use. Delicious desserts also deserve to be sliced professionally. The gourmet cake knife from WÜSTHOF has a nice serrated edge for easy cutting and a wide blade for serving. It was a pleasure to be able to cut through the cake without having it crumble. When it comes to baking like a pro, the right kitchen tools really do make a difference. Bowls, graters, and extracts are all equally important so stick with brands you know and trust, like Nielsen-Massey, Microplane, Anolon , and WÜSTHOF . These gracious sponsors have provided us with the items in our bakers dream giveaway. Enter below for your chance to win! Preheat oven to 400 degrees F. Line the loaf pan with parchment paper cut so that it overhangs the short sides by 2 inches and another piece of parchment paper cut so that it overhangs the long sides by 2 inches. You will use these overhangs as a sling to lift the cake out of the pan after it is baked. Using the mixer, beat the eggs with the sugar until pale and thick, about 3 minutes. Add the vanilla and beat to combine. Add the flour, salt, butter, and half-and-half; mix until combined. Do not peel the pears. Simply cut them into very thin slices and stir them into the batter. It will look like it is all pears, and you will not see much batter once it is all mixed. Scoop this mixture into the loaf pan, pat it down flat, and bake for 45-55 minutes, until a tester comes out clean. Take the cake out of the oven, and increase the oven temperature to 425 degrees F.
Heat the brown sugar, half-and half, butter, and salt in a saucepan until it comes to a boil then let it bubble away for 2 minutes. Poke holes in the top of the cake with a fork or a skewer. Pour half of the hot carmel mixture over the cake and place the cake back into the oven to bake for another 12 minutes. Reserve the remaining sauce. Remove the cake from the oven, cool for 5 minutes, then gently lift with the parchment paper and slip the cake onto a serving plate. Remove the parchment paper and cool to room temperature for 20 minutes. To serve, use a serrated knife to gently cut the cake into 1-inch-thick slices and ladle a bit f warm caramel sauce over the top. This post is organized by Virtual Potluck and sponsored by Anolon, WÜSTHOF, Paula Deen, Microplane, Gibbs-Smith, and Nielsen-Massey, who provided products to the participating bloggers as well as items for our giveaway. As Always, all opinions are my own. WoW. You do have some great give-a-ways!! I love the bakeware if I need to choose! The cookbook sounds fabulous too. Ooh la la !! This looks like nine kinds of amazing! Oh my goodness this does look amazing! What a treat to serve!! The cake looks so delicious!! I love the pear and caramel combination. And those bowls are SO much fun!! Looks delicious!! I love the striped mixing bowls but I think having a real cake knife would benefit me most! I'm most excited for the cookbook!! Would love a copy of it! What a bonanza package to win! All the items are fantastic, but I think we would really like the WÜSTHOF GOURMET 6-inch Cake Knife best. Love that cake! I think I need to go make that now! What a fun giveaway and that cake looks amazing! I am interested in the almond and lemon extracts. I am most excited about the Microplane Premium Classic Spice Grater and Spice Cup Grater. I am excited about all of them but I could really use those bowls! All the prizes are great but the Microplane Premium Classic Spice Grater and Spice Cup Grater would be my favorite. Note: You have the wrong link in the entry field for following Bowl Me Over. The cake looks delicious, but I love the silicon handles on those pans! I have never seen baking pans like that. Yum! You're right ... French desserts are the best kind of desserts, and I looove pears! Plus, I totally agree that the right cookware and utensils are key to great recipes! The Anolon 5 piece bakeware would really be a blessing this year! YUM! Pear and salted caramel are the perfect combinations for the fall. Thank you for sharing! I love those red and white striped bowls!! SO cute! I have seeking a recipe like this one! Thank you so much for posting! I am most excited by the 5 piece bakeware set. I love that 3-piece mixing bowl set! Great giveaway and that cake sounds wonderful! I'm excited about the Paula Deen 3-piece mixing bowl set. That sounds utterly divine! A great way to use up those pears lurking in the fridge! That cake looks amazing! And I wouldn't mind winning that prize! I am most excited about those gorgeous bowls! I am totally excited about those bowls! Love those bowls! Plus, I could use some baking supplies! Just entered to win! That cake looks amazing and I would LOVE that cookbook! The 5 piece baking set from Anolon. I'm most excited about the Anolon Advanced Bronze 5-piece baking set. It's hard to select a favorite item in your giveaway, but I think the cookbook sounds awesome from your description. And I have to also say that this pear and salted caramel cake has to be made in my kitchen very, very soon! Thanks for the chance in your giveaway! I saw this photo on your Instagram and HAD to come see the recipe! YUMMY! Yum! I love baked pears, they have such a beautiful naturally sweet flavour. Also, this baking set looks divine! I'm most excited about the mixing bowl set! What a fantastic giveaway. That cake knife is gorgeous. As for the cake - this needs to be on everyone's holiday table - yum! The Pear and Salted Caramel Cake looks divine! Absolutely love the Analon Baking Set! Very timely and generous giveaway! The French Desserts book is the item I'm most excited about, I love all things French. I am most excited about some new pans! My pans are so old and need to be replaced so badly. Those stripey bowls have my name written all over 'em! I love the Anolon Advanced Bronze 5-piece baking set. But what I love is your cake. Oh my gosh, looks amazing! Oh you know I follow you on Instagram! The 5-piece baking set! I LOVE Anolon! The bowls are amazing! Love the stripes and perfect for mixing ingredients separately. I'm most excited about the Advanced Bronze 5-piece baking set! love those red striped bowls. So cheery looking. I follow Food Hunter on Instagram as sandyheadtke. Great giveaway! I want those bowls! The stripey bowls are really cool. The pans! Thanks for the giveaway.